This item is unavailable for an indefinite period. 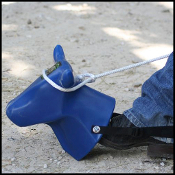 This is an excellent way to work on your roping skills and have some fun at the same time! Just strap this head to your boot and get to roping. This plastic head is extremely durable, great for kids and adults, very portable, and fun for all ages! Comes with strap and play rope. Available in black, blue, pink, orange, and yellow. Only color in stock at this time is Blue and there is no date for future colors to be available.